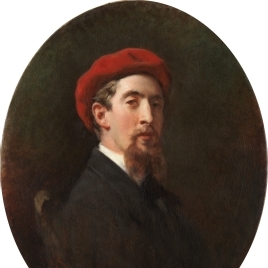 This masterpiece by Raimundo de Madrazo represents his mature style in a worldly portrait painted with a personality that transcends his varied and different influences. Made a year before he was awarded first prize at the Universal Exposition of 1878 in Paris, it reveals the confidence of maturity. Moreover, this is a portrait of a very close friend who was also an outstanding collector. 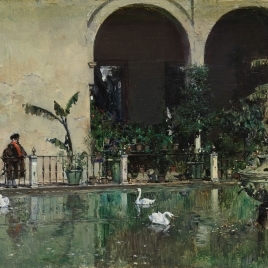 Errazu played a fundamental role in that Exposition as well, as the success of the Spanish presence there was largely due to the presence of works from his own collection, including numerous pieces by Fortuny, Rico and Raimundo de Madrazo himself. And Errazu, who had only just begun collecting at that time, must also have had his taste in art confirmed by the critical praise his paintings received there, so the present portrait, painted by his friend and probable advisor on acquisitions, would have reinforced their mutual consideration and esteem. Raimundo’s friendship with Errazu is manifest in the dedication, and in his profound knowledge of his model’s personality, which led to an interpretation of this wealthy and refined figure that accentuates his elegance without artifice. 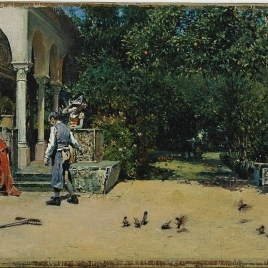 The lessons Raimundo de Madrazo learned from his father, and his study of Velázquez’s tradition at the Museo del Prado are manifest here in various aspects: the limited palette, the ambiguity of the space, with no separation between the horizontal and vertical planes, the presentation of the model with a natural yet elegant air, the placement and stylization of his feet, and the long brushstrokes in the background. 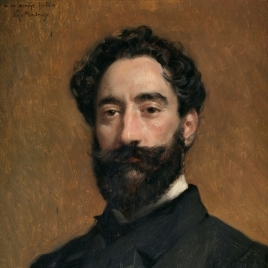 At the same time, in Paris, Madrazo became progressively more receptive to the style of portraiture that had been highly successful in France since the Second Empire, and by the final quarter of the 19th century, he himself had become one of the most qualified portrait painters in Paris’s high society. Thus, his intention of making the figure more elegant led him to depict his friend as taller and more slender than in real life, as can be seen in a comparison of this portrait with the photographs of Errazu by André-Adolpe-Eugène Disdéri now at the Bibliothèque Nationale de France. 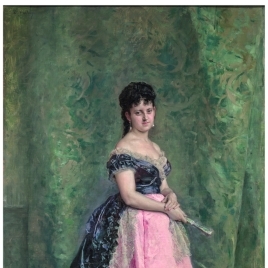 A similar stylization appears in other portraits by Raimundo de Madrazo, including one he painted a year later: his likeness of Errazu’s friend, the Marchioness d’Hervey de Saint Denis (Paris, Musée d’Orsay), who was one of the foremost ladies in his circle. The present work’s peculiarly vertical and narrow format can be related in some ways to the influence of Japanese prints that the author knew well. Like his friends, Mariano Fortuny and Alfred Stevens, he was attracted to the rich color of art from the Far East. At any rate, here, the vertical format serves mostly to accentuate the lengthening of the figure, which is favored by the distinction with which he wears his elegant suit, and his only adornment: a thick gold ring that holds his white tie. Finally, the blurry character of the background that contrasts with the precise profiles of the figure can be linked to photographic portraits (Text drawn from Barón, J.: El siglo XIX en el Prado, Museo Nacional del Prado, 2007, pp. 328-332). Height: 224 cm. ; Width: 96.5 cm. Museo Nacional del Prado, Catálogo de las pinturas del siglo XIX, Ministerio de Cultura, Madrid, 1985, pp. 157. El legado de Ramón de Errazu: Fortuny, Madrazo y Rico, Museo Nacional del Prado, Madrid, 2005, pp. 166, nº23. Díez, José Luis; Barón, Javier (ed. ), El siglo XIX en el Prado, Museo Nacional del Prado, Madrid, 2007, pp. 329/ lám.75. 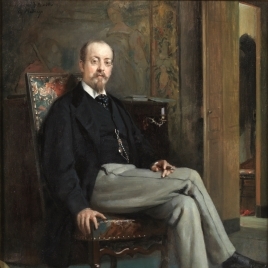 El retrato español en el Prado del Greco a Sorolla, Museo Nacional del Prado, 2010, pp. 38. Inv. Nuevas Adquisiciones (iniciado en 1856). Núm. 1366. 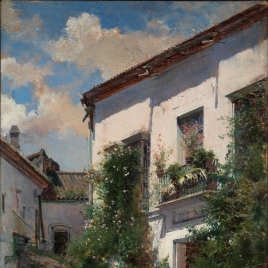 Catálogo Museo del Prado, 1910. Núm. 11. Catálogo Museo del Prado, 1942-1996. Núm. 11-ERR. Catálogo Museo del Prado, 1985. Núm. 2614.